Lorna is Subject Leader in Ceramics and Related Materials Conservation at West Dean College. 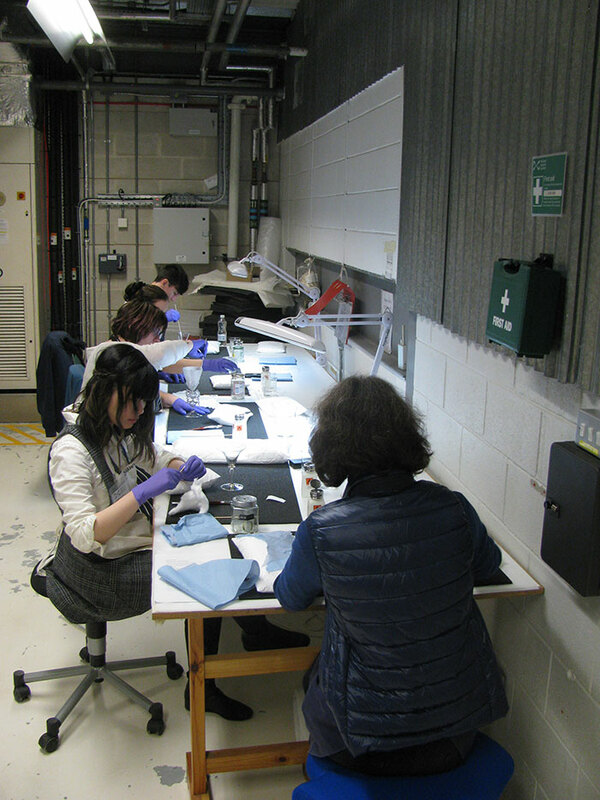 Recently, a group of Graduate Diploma students from West Dean College, West Sussex, were invited to contribute to a fascinating National Museums Scotland glass conservation project. So for five days, Derrin, Rosie, Shawn, Kate and I were based at the National Museums Collection Centre in Edinburgh. 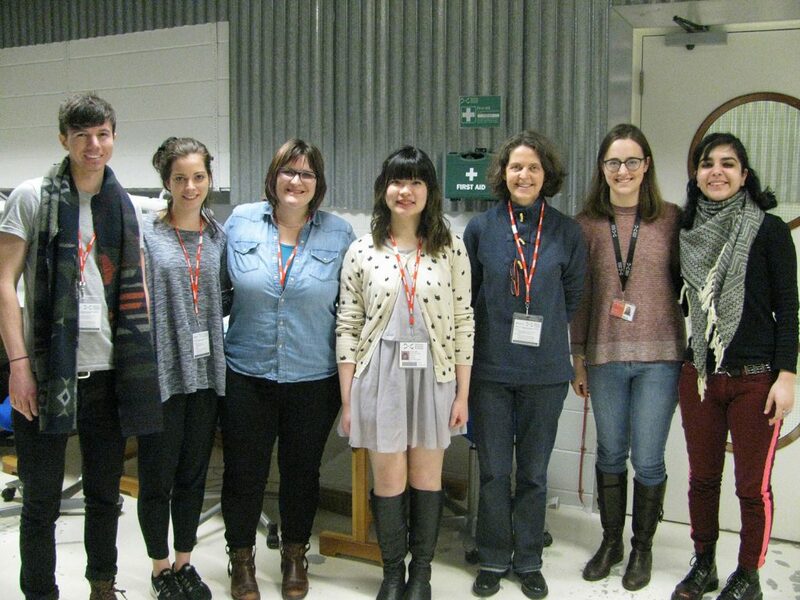 Derrin, Rosie, Kate, Shawn, Lorna, Margot Murray and Amreet Kular (UCL intern). Our workstations within the Collection Centre. The project was instigated by conservators Charles Stable and Stefka Bargazova and involved the inspection and surface cleaning of over 300 individual objects, many of which had been identified as suffering from glass disease. – Li, H. “The Problem of Glass Corrosion.” Conservation of Museum Glass. London: Imperial College. Unfortunately there is no miracle cure to stop glass disease. Cleaning of the glass as well as storing the glass in a stable humidity controlled environment can reduce the rate of deterioration and extend the object’s lifespan. Equally, too much cleaning can also be damaging, so the glass is only cleaned every ten years. Example of crizzling glass from the collection. It is always a challenge to handle historic glass due to its natural delicacy and potential to have vulnerable previous restorations and, as expected, many did prove especially fragile due to inherent failure within the glass matrix. Individual objects could be incredibly delicate. Stefka provided us with a well-defined method, outlining appropriate conservation materials and techniques to be employed, and work stations were kindly set up for us so we could start straight away and make the most of the time available. Stefka had devised clear guidelines outlining appropriate conservation materials and techniques to be employed. Moving so many delicate objects from their storage shelves to workbenches and back required careful planning and execution. Charles was on hand throughout to manage this and all other aspects of the project, such as checking inventories and taking images of completed objects to aid our workflow. Charles was on hand to support all aspects of the project. A large part of the enjoyment came from working with such a diverse range of objects – glass that reflected aspects of social history, material culture and decorative styles over a broad date range and it was a pleasure to work with the National Museum Scotland conservation team, which coincidentally, included alumni of our Programme, both a recent graduate and Stefka herself. National Museums Scotland colleagues Margot, Amreet and Stefka. We were very grateful to Charles, who fitted in a tour of the National Museum of Scotland in Chambers Street for us. This highlighted the beauty of the main buildings, the extent and diversity of the collections and impressive feats of conservation. Sarah Rothwell, Curator of Modern & Contemporary Design, kindly took the time to show us further ceramic and glass stores, where we were able to view in detail other wonders from the collection. 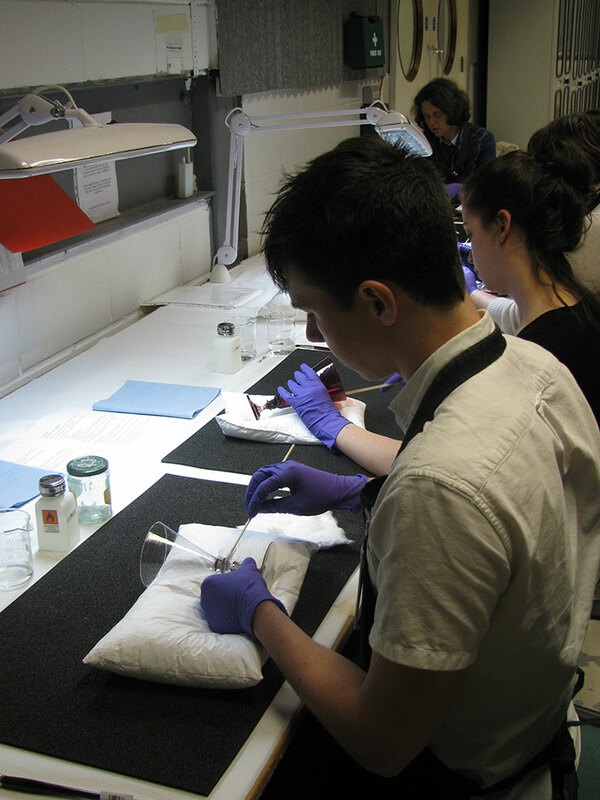 A major benefit for the students was to experience the reality of working in a museum context, and being able to witness, first-hand, the professional organisation and management of a complex project to a tight deadline. Importantly, the stabilised objects can now continue their journey as tangible expressions of our collective past. 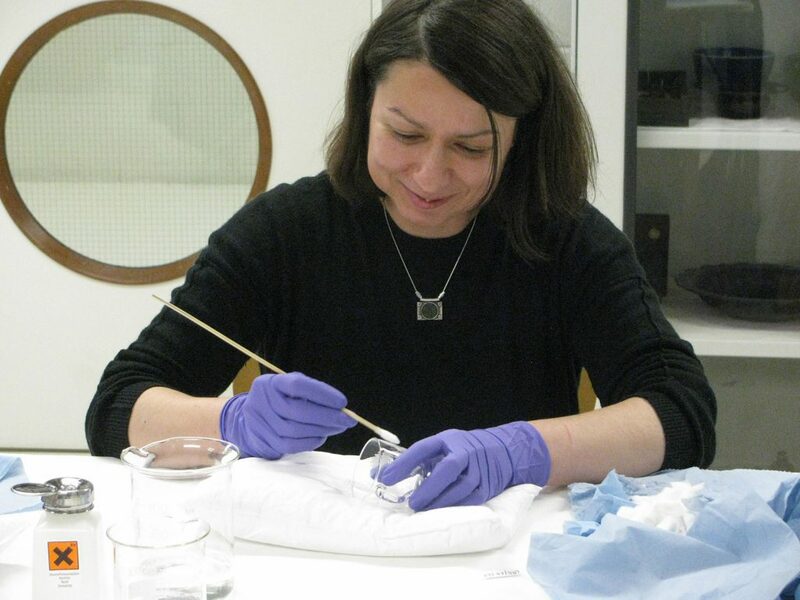 ‘I felt very privileged to be able to participate in this project and experience working in a museum setting as it has given me an insight into the work environment of a conservator. 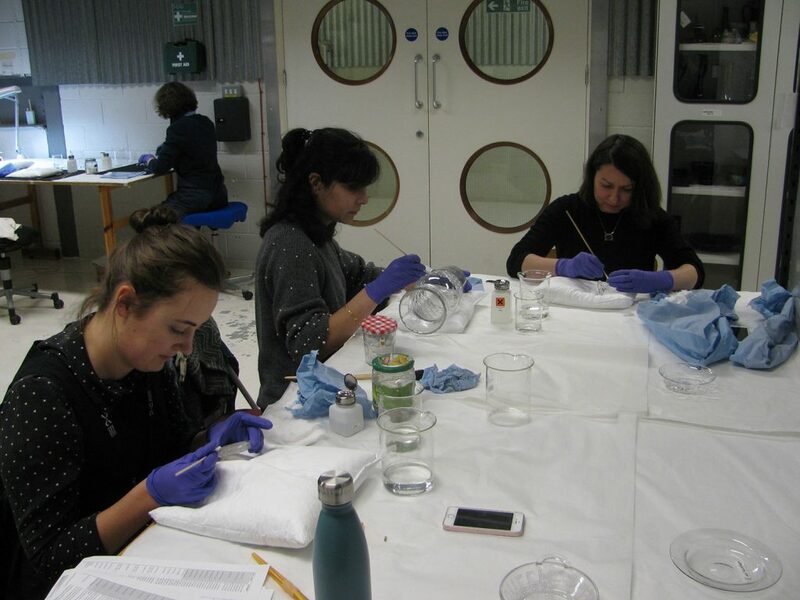 Cleaning sick glass is also a good preparation for the Postgraduate Diploma, where we will be investigating the care, conservation and restoration of glass objects in greater detail. ‘The glass we cleaned in Edinburgh was Venetian, Austrian, German and Scottish from the 17th and 18th centuries as well as the contemporary period. ‘One of the most challenging glass objects I had to clean was relatively tall, with a metal fitting near the base. The metal fitting had to be avoided while cleaning the surface of the glass to avoid moisture affecting it. ‘The most beneficial element of the experience for me was having the opportunity to handle a range of glass objects. I am now able to identify signs of deteriorating glass and clean it in a safe manner. I am also able to recommend glass objects for further conservation if they are particularly unstable. 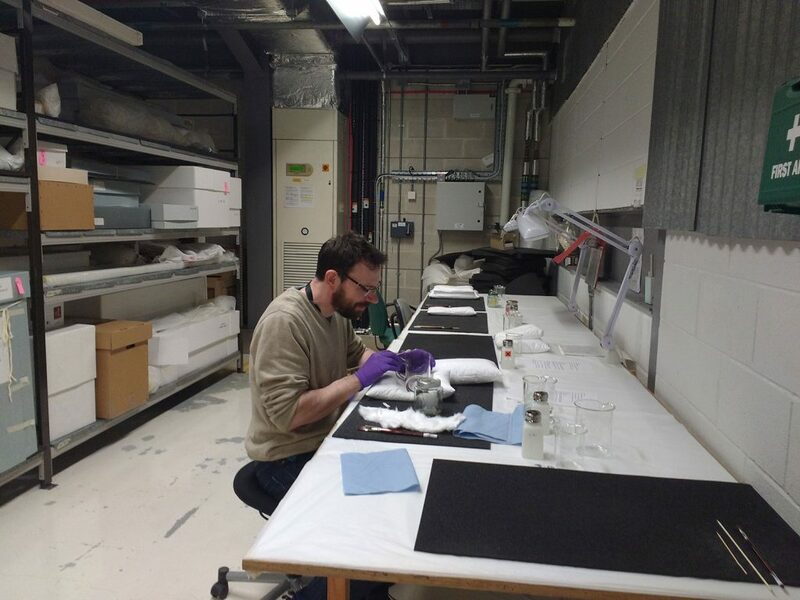 We felt the glass project was a successful collaboration between National Museums Scotland and our conservation training programme, and we would be pleased to repeat the experience if further projects arose in the future. So, finally, a big thank you to the conservation team and colleagues for their warm welcome. 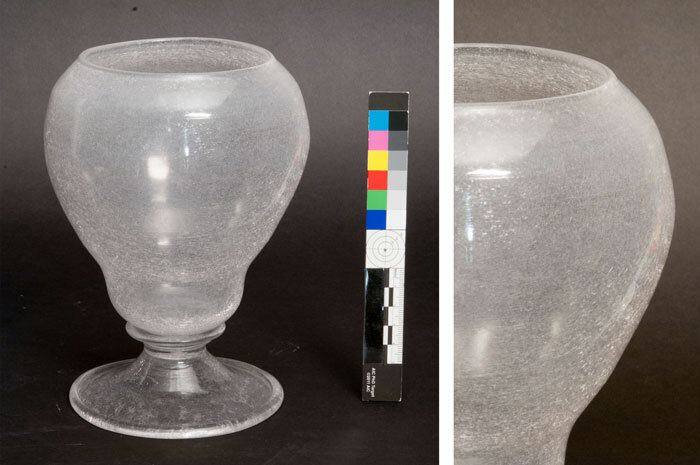 Fascinating – but HOW the glass was treated would have been so illuminating.